King Koil Mattress was started in 1898 by Samuel Bronstein in St. Paul, Minnesota with only six employees working in a very small factory. From there on, they've grown from a little Mom and Pop business to one of the largest manufacturers of mattresses not only in this country, but many others including Canada and Indonesia. They have 9 licensees in the US and over 30 licensees around the world in over 80 countries. They mainly produce low to mid priced innerspring and hybrid models. 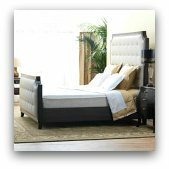 King Koil mattress prices are generally quite reasonable and their offerings are meant to be competitive with mid-range products from big names like Serta and Simmons. They have over a hundred years of engineering and manufacturing experience behind them. The company has been offering mattresses at an excellent price since the late nineteenth century. They can truly be said to have established a global presence. That being said I am not a big fan of the licensee model of doing business. With so many different organizations manufacturing their products, it can become difficult to maintain quality control and consumer confidence. Without extremely strong central oversight, the companies efficiency and service record can vary greatly from country to country and even in different regions of the US. 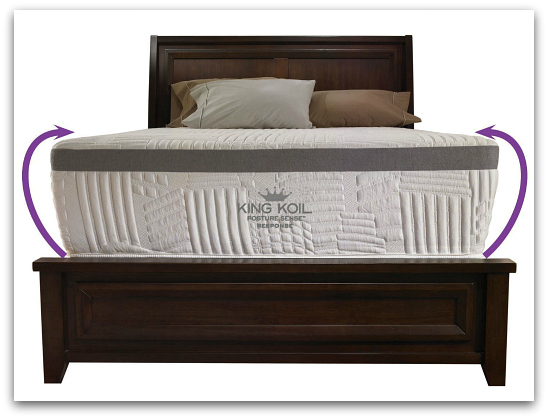 Will the King Koil mattress you find in Indonesia be the same mattress for sale in Canada? Are the same exact materials even available in both areas? It's hard to say. I'm not stating this is the case with Comfort Solutions but the potential for problems is certainly there. As they've grown, they've received awards and have been endorsed by the International Chiropractic Association and also the Foundation for Chiropractic Education and Research, for whatever that's worth. It seems like every major mattress brand has developed an association with an official sounding medical organization. This of course can be used in their advertising campaigns to promote their mattresses as providing proper spinal posture and more rejuvenating sleep. It's common practice in the industry and leaves me skeptical as to whether these endorsements have any meaningful value. In 2004 King Koil Mattress changed their name to Comfort Solutions to encompass they're expanding product line. They also intended it to reflect their desire to help individual consumers find the best sleep surface for them. Comfort Solutions now encompasses four different mattress brands which each have a different focus. They are King Koil, IMattress, Laura Ashley and Flare. 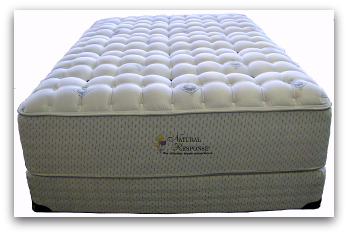 The firmness levels offered are firm, plush, pillow top and euro box top. Spine Support was the company's original entry level product line but has recently been discontinued. The Spine Support models can still be found in stores and are similar to the King Koil Perfect Contour and Posture Sense models. They're traditional innerspring mattresses which emphasize proper sleeping posture and are "endorsed by chiropractors". This general idea continues on in current King Koil mattress products. Natural Response also appears to have been discontinued. It was their top of the line luxury brand. They used expensive materials and fabrics. The company supposedly developed a new type of synthetic latex called Ventilex which was able to regulate body temperature and keep you more comfortable while eliminating pressure points. This was the latex King Koil mattress and the only one which didn't use springs in the support layer. They were meant to be very pampering and were somewhat more expensive. The latex also probably made them more durable in general and thus worth the extra money. It looks like the company is getting ready to roll out a new flagship line called World Luxury King Koil Mattress sometime soon. 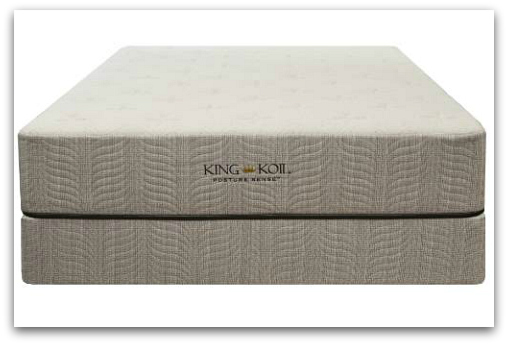 The Posture Sense is the entry level in the King Koil mattress product line. The support layer consists of a spring coil assembly which they claim offers better support because of it's "alternating coil system". They also claim that it's engineered in cooperation with the International Chiropractor's Association to provide proper spinal alignment and thus relieve back pain. This is the same group whose endorsement they mention above. In my opinion this all just meaningless sales talk. Despite what you may hear,the only real difference between the many different designs of spring coils is the gauge of the steel and whether they are independently pocketed coils. Obviously heavier gauge steel is stronger and more durable. In certain cases lighter gauge steel may be better suited in a design because it's not as stiff and thus more pliable. Separately pocketed coils are a superior innerspring design in which the coils are not woven together into a single connected unit. They are instead each encased in a sock like cloth which allows them to move independently of each other. This has two important advantages. First, it greatly reduces motion disturbance (although still not as well as memory foam or latex) so you don't disturb your partner as much when moving throughout the night. Second, it greatly reduces pressure points by allowing the heavier parts of your body (shoulders and hips) to sink into the springs where needed in order to maintain correct posture. In my opinion this is the only innerspring design which may actually reduce back pain, especially when combined with a high quality comfort layer. 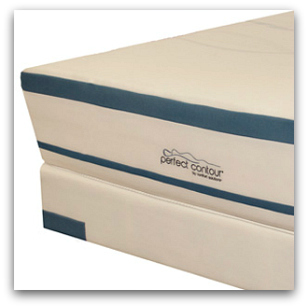 Speaking of comfort layers - The Perfect Contour model claims to have "zoned support" in it's comfort layer, provided by it's "super soft Perfect Contour foam". Five zones consisting of head, shoulder, hip, knee and foot to be exact. In my research, I've found that "zoned support" is usually just more nonsensical sales talk. There's simply not enough material present in the comfort layer to make any meaningful difference in the quality and density of the foam. The idea that the cheap polyurethane foam in a $500 King Koil mattress is going to be designed with 5 different zones of varying thickness and density in order to provide the perfect feel for your head, shoulders, hips, knees and feet is just plain silly. In my experience, the only way you're ever going to experience anything even close to this is on a high quality memory foam bed costing $2,000 minimum, like a Tempurpedic, which is what I personally sleep on. Furthermore, when you're referring to the comfort layer of the mattress, the word support should not even be in the same sentence. The purpose of the comfort layer is the exact opposite of the support layer. It is there to make the support layer comfortable - to allow your body to sink inwards to a softer surface and protect your body from the firm support layer which is pushing back, often creating uncomfortable pressure points. 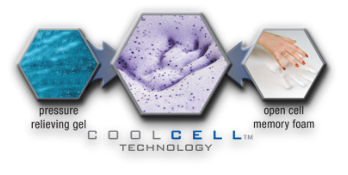 They also tout their layer of "Cool Cell" technology which supposedly combines the benefits of memory foam with the cooling properties of gel. Memory foam infused with gel is the latest big thing in the industry. Gel supposedly sleeps cooler than memory foam, solving the heat issue that memory foam is well known for. It also has some of the same pressure relieving properties of memory foam so that when combined they form a cooler, more breathable foam which is still just as comfortable. Well, my research has indicated that the jury is still out on these claims that gel makes visco elastic foam "cooler and more breathable." And even if they are scientifically sound, the Cool Cell gel and memory foam mixture used in a King Koil matress is already obsolete. Their pictures show that they're mixing gel beads into visco foam that has already been manufactured. That's the old (and cheap) way of doing it and not only does it not work, but it may actually degrade the quality of the memory foam making it less elastic as well as less durable. Much more effective ways of mixing gel with memory foam have been devised in which the two substance are combined in liquid form before even being poured into the mold. 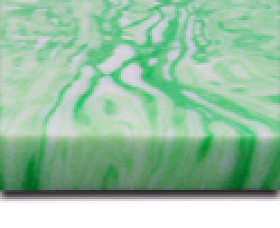 This produces a solid slab of foam with the colors of the two different materials swirled together in an interesting manner and results in a high quality (and still fairly expensive) product with some intriguing properties. But like I said, the stuff is still too new for there to be any consensus as to whether it's everything it's claimed to be. 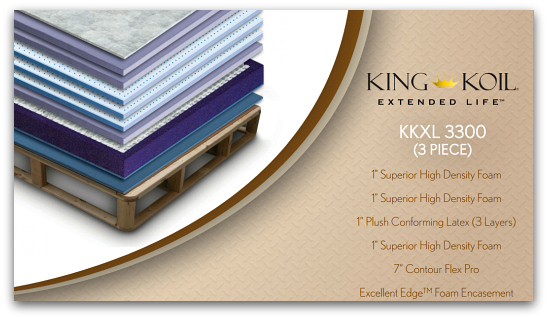 Finally we have the "Excellent Edge" King Koil mattress feature. Comfort Solutions version of reinforced edges around the perimeter which provide a solid seat and "10% more sleeping surface". This "feature" is so common that it has become part of basic mattress construction. If you want to manufacture innerspring beds in today's world and compete on any serious level, you better have a reinforced perimeter. The foam used doesn't cost that much. Only the cheapest products out there are going to skimp in this area. The idea of a mattress with 10% of it's surface which can't be slept on because you'll roll off onto the floor is laughable. 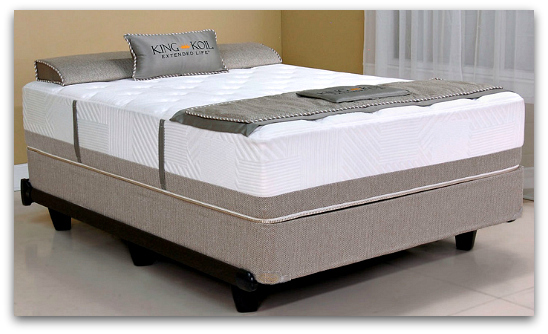 Posture Sense Response is the next step up in the King Koil mattress line. It uses all the same materials as Posture Sense. The only real difference is that it uses pocketed coils in the support layer instead of an interlocking innerspring unit. This should certainly improve support and reduce motion disturbance. It may have a thicker comfort layer as well but they don't make this clear. It looks like a higher quality bed but looks don't mean anything - especially when it comes to mattresses. They say that it's a hybrid but a hybrid of what? My definition of a hybrid is any mattress that combines innersprings with memory foam or latex. In this case all of their beds are hybrids, making this distinction simply more sales talk. The XL Extended Life models are the top of the line King Koil mattress. Basically they're meant to last longer. Now why didn't I think of that? Seriously though, they're built for larger people who need a stronger bed with better support, comfort and durability. Sadly, what passes for a regular mattress these days tends to fall apart quickly under bigger weight loads. In some cases they don't even last under normal weight loads. Obviously they can be used by anyone who simply wants a better mattress. The materials included in the mattress are much more impressive than their other models and look like they mean business. The innersprings used in the support layer are made from heavier gauge tempered steel which increases their strength and durability. There are quite a few more coils included in the construction of the unit as well. They are, of course surrounded by a reinforced foam encasement. The comfort layer is quite thick uses use four different types of high quality foam. First there's a layer of what the company calls "Extended Life" foam on top of the innersprings. Then there's a layer of "Visco Supreme Plus " memory foam which appears to be decent high density memory foam and is definitely not the junk mixed with gel beads from their cheaper models. This is topped with a fairly thick layer of Talalay rubber latex, which is not cheap. 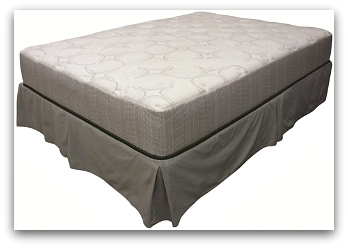 It's durable and is well ventilated so it will eliminate any heat issues from the memory foam. Finally there's a top layer of "Superior High density" foam which is meant to make the surface softer, more comfortable, and extend sleeping time since latex can feel somewhat firm. Underneath it all is a very impressive foundation which appears to be built to withstand being run over by a truck. It contains about three times more wood than an average boxspring and is more well reinforced than most others I've seen. This is where a lot of companies skimp on construction because they think it won't be noticed. Plus they want you to buy a new one every few years with a new mattress anyway. But not in this case. If the XL mattress lasts as long as it's foundation it will be quite an achievement. I really have to hand it to King Koil here for attempting to make a quality product like this and call it what it is. There's always the risk of someone thinking "well if this is their "Extended Life" model does that mean everything else they make is cheap junk that's going to fall apart in a just a few years? If you want to maximize your chances of getting a "no sag" mattress in general, then don't buy a pillowtop model. Stick with a plush tight top. Pillowtops are notorious for premature sagging. I'd love to hear from someone who's owned an Extended Life King Koil mattress for a few years and see what they think. Even if the company only makes one high quality bed that's worth owning, they're still doing better than most of the other big name manufacturers. These mattresses come with an extended 25 year "no sag" warranty but make sure you read it anyway. Warranties are often used as marketing tools and sound great on the surface but are not so great once you read the fine print. The available sizes are King, Queen, Full and Twin and the firmness choices are firm, extra firm and luxury firm. 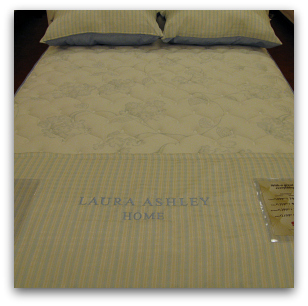 Laura Ashley - Beautiful and Smart? 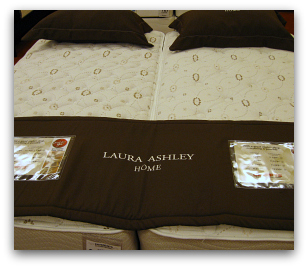 The Laura Ashley brand is Comfort Solutions designer bedding line similar to Serta Vera Wang mattresses. They feature creative and elegant themes with unique patterns which you won't find anywhere else. They're specifically targeted toward women with a flair for style and are available in the somewhat more expensive Laura Ashley Luxury, Elite and Iadapt product lines. I'm not a fan of designer mattresses associated with big names in fashion. Personally, I'd have to say that the way a mattress looks is the least important thing about it, especially considering that the only time you're ever going to see it is when you remove the sheets to wash them. Are you going to sleep better knowing that your mattress is pretty and named after a fashion designer? Somehow I doubt it. As far as I can tell the only purpose of branding a line of mattresses with the name of a fashion designer is to raise the price. The Laura Ashley models appear identical in construction to the Posture Sense Response King Koil mattress line. The Laura Ashley Luxury model has encased coils in the support layer. 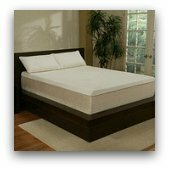 The only difference in the Elite model is that they add a layer of Talalay latex in the comfort layer. From the specs they look like decent enough mattresses as long as they don't cost extra. I certainly wouldn't pay a dollar more for designer upholstery. "Beautiful and Smart" is the marketing tagline used for this brand. I'd say "nice looking but otherwise average" would be more appropriate. The Flare Mattress - Changing The Shape Of Sleep? Comfort Solutions has come up with an interesting idea for mattress design in which the sides are angled up and outward. This makes the top surface larger than the bottom. Their tagline is "changing the shape of sleep." You wind up with an oddly shaped mattress that they claim has 15% more sleep surface and yet still fits in your existing bed frame or bedroom space. I'm pretty sure this is a first in the industry. They say that because of the shape of the sides they are just as strong as the edges on a regular mattress and present no higher risk of rolling off. It could be just another advertising gimmick but If it works as they claim, it sounds like a great idea. More sleeping area is always a good thing, especially if you have space constraints in the bedroom. If it allows you to replace your full size mattress with something roomier and more comfortable then it could be a major breakthrough in mattress design. It certainly shows creative thinking and if it proves to be a useful feature it could be a stroke of marketing genius. It is quite a novelty. After all, how many people can say they have a mattress shaped like a trapezoid? If you're still thinking of purchasing a King Koil mattress, probably the only one worth looking into is the XL Extended Life. 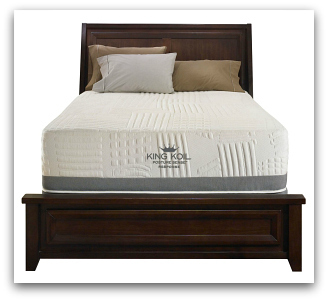 While there are many websites willing to sell you a King Koil mattress online, you should still visit a local store. It's a good idea to see the products available first hand and test them. If the Flare design is something you can use then I would definitely check it out as it could prove beneficial. Personally I wouldn't be able to resist testing one just out of curiosity. You should definitely spend some time lying on any bed you're thinking about buying in order to get a feel for whether you'll like it. Just remember that you can't tell how long a mattress is going to last by how comfortable it is. A brand new mattress made with cheap materials can feel just as good as one with high quality construction. The only way too really know is to find out what's inside, which isn't always easy to do, or to sleep on it for a few months. King Koil mattress products are made with the goal of offering the kind of sleep experience everyone wants, at a price point that most people can afford. How successful they are in meeting this goal is still in question. For more information on the opinions of real owners of Comfort Solutions products continue reading here - King Koil Reviews.